Mechanically, we are more used to thinking of red as getting a clause relating to being required to attack. But it does fit with the obsession angle in the card’s concept, and I think in a meta-design sense, it might be useful as a reminder to attack and get the game to some kind of conclusion. 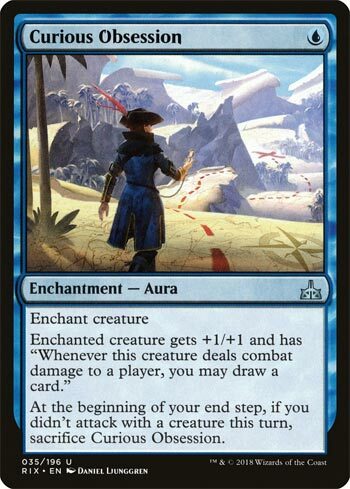 Drawing a card on combat damage is an ability with incredibly good pedigree – there is no way to count the number of games that have been won on the back of creatures like Ophidian, Thieving Magpie, Shadowmage Infiltrator, Ohran Viper, and Scroll Thief, and blue also has probably the best selection of evasive creatures in the game. You know the old joke about the way to make any spell strong enough for constructed, by adding the phrase “draw a card”? It works for creatures, too. Now any creature can be a Ninja of deep Hours. There are so many blue creature with evasion this card can go on. Play a Slither Blade on turn 1 and you have a 2/3 card advantage machine. Heck, attach this to an Ornithopter on turn 1! Its pretty easy to pump out creatures to attack with when you are drawing two cards a turn. The downside is you are forced to be aggressive with this card, but if you get just 2 hits in Curious Obsession is well blue mana investment. It’s a cheap version of the Curiosity effect that also gives you a stat buff. All you have to do is attack every turn. Simple enough, right? And it’s in blue, the color of evasive creatures. Curious Obsession can run away with a game if you get it down early and get to swing every turn, and the downside isn’t massive in the long run. It’s a cheap, effective way to grind the game in your favor.